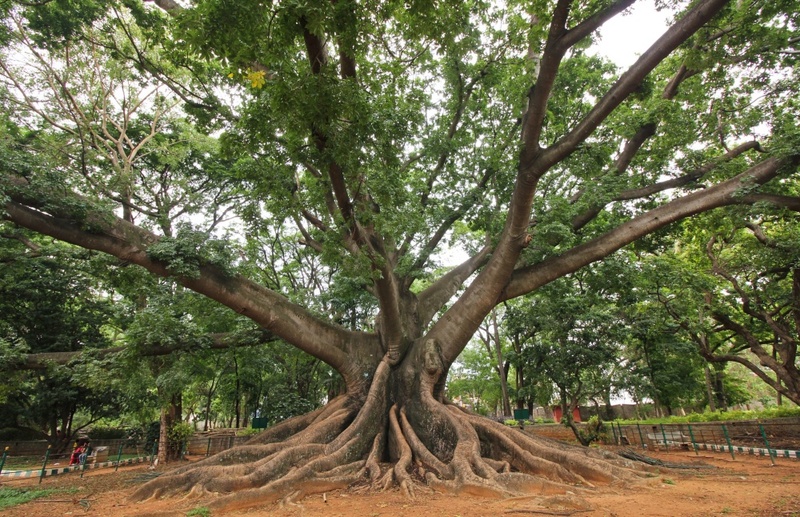 Kapok is a large, imposing tree originating from tropical America, its natural range extending from Mexico, through Central America and the Caribbean, to northern parts of South America. 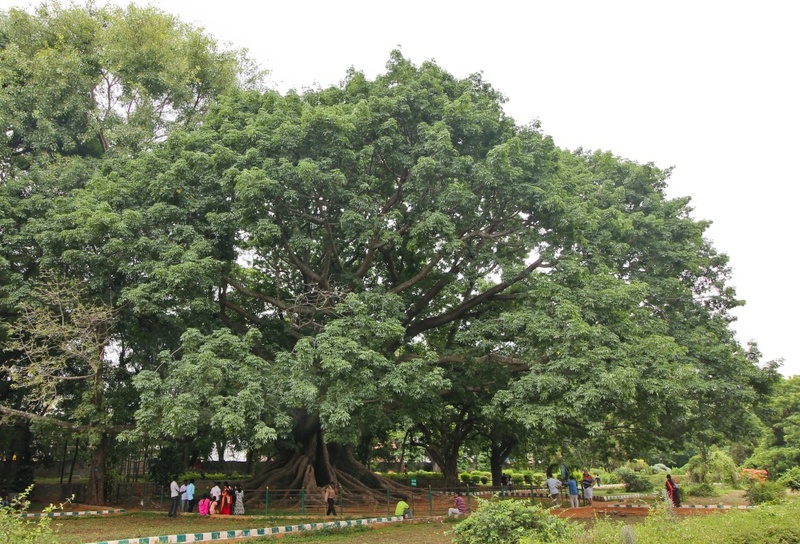 Exceptional specimens may reach heights of up to 40 m (130 ft), though it is more commonly a medium-sized tree 15 to 25 m (50 to 82 ft) tall. 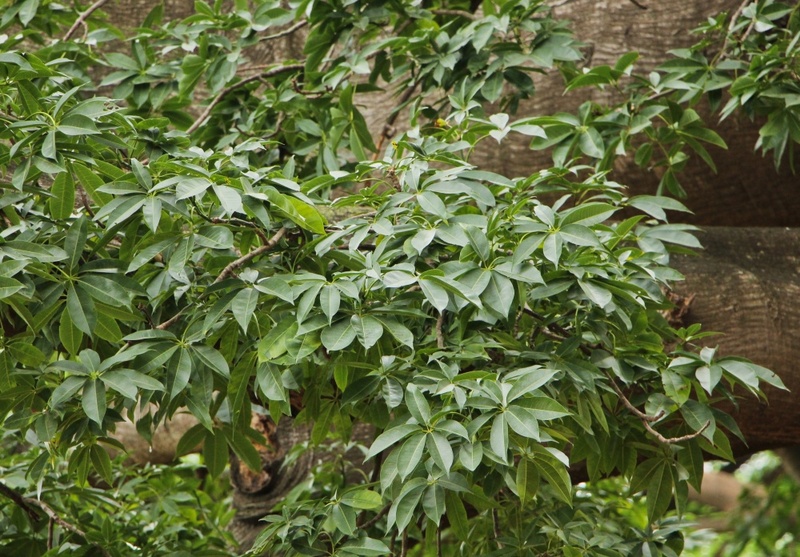 There are two subspecies recognised, Ceiba pentandra var. indica and Ceiba pentandra var. caribaea. 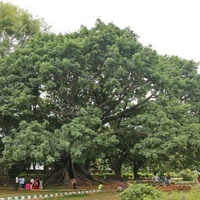 The latter easily distinguished by its large, prominent buttresses on mature trees, rising from the ground to a height of 3 to 4 m (10 to 13 ft) up the trunk. The trunk may be clear of branches for most of its height or is low-branching, depending on the growing conditions. 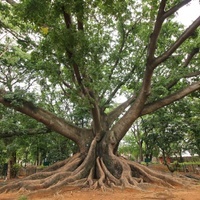 On well-formed trees, the trunk is tall, straight, round and bulbous, with prominent buttresses near the ground and a wide-spreading umbrella-shaped crown at the top, made-up of far-stretching horizontal branches. The bark is grey and smooth, except for stout pyramidal spines on young trees, these becoming absent on mature trees. The leaves are palmately compound, with five to seven dark green leaflets, and are arranged close together, casting a deep shade on the ground. Leaf-fall occurs in areas with a long or pronounced dry season, leaving the limbs and branches bare and exposed. Flowering occurs when the tree is leafless, with blooms of large five-petaled, whitish or pinkish cup-shaped flowers. They are borne singly or in clusters of a few, and in large quantities, though not every year. Opening just before sunset, they remain open throughout the night to be pollinated by bats, the tree's specialist pollinators. Fertilised flowers are followed by oval fruit 10 to 20 cm (4 to 8 in) long, green when young, becoming dark brown when mature and with a weak shell that may be crushed by hand. At full maturity the shell splits into five longitudinal sections, exposing a mass of wholly, creamy-white hairs, within which are up to a hundred small rounded black seed. The hairs or fibres produced by the fruit are known as 'Kapok fibres' and these were commercially exploited until mostly replaced by synthetic fibres derived from petroleum. Although not suitable for weaving into fabric, because of their smoothness and weakness, their springiness, moth resistance, water-repellent and buoyancy properties make them highly suitable for stuffing pillows, mattresses, sleeping bags and flotation devices, as well as material for insulating against sound and temperature. Yields have been estimated at 2.7 to 4 kgs (6 to 9 lbs) of fibre per tree, per year. The seed contain about 25% of a pale yellow to brown, non-drying oil traded as 'Kapok oil', which after refining is used in much the same way as refined cottonseed oil. It has been used for various purposes, including as a lamp oil by traditional people and in more recent times for making margarine as well as soap. The leftover press-cake can be fed to livestock but is largely indigestible and is more suitable as an organic manure or fertilizer, due to its good concentrations of nitrogen, phosphorus and potassium. The wood is lightweight, averaging around 330 kgs per cubic meter (20 lbs per cubic foot), and has low natural resistance to rot, decay and wood-boring insects. This limits its suitability for construction purposes, other than as a substitute for Balsa (Ochroma pyramidale). In the coastal parts of the tree's natural range, the trunk of suitably tall, well-formed trees were made into sea-worthy canoes used for fishing. These were known as 'dug-out canoes' because they were made by hollowing out the wood from the centre, after which the cavity was ribbed for reinforcement and the exterior shaped and painted. The craft of making dug-out canoes from Kapok trees has now mostly died out, as a result of the development of fibreglass canoes. The flowers produce abundant nectar as well as being a valuable source of pollen for brood-rearing honeybees, making it one of the most important trees for beekeepers in the tropics. The pure honey is pale amber with a characteristic sweet honey taste. The bark on wounding yields a dark gum which is an astringent and is used in India as a treatment against bowel complaints. The gum swells in water and is similar to tragacanth-type gums except for its colour. 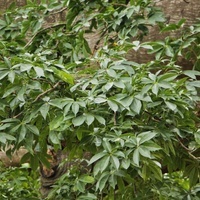 Its properties and medicinal use are similar to that of Karaya gum (from Sterculia urens). According to the National Science Foundation of the United States (NSF), the flowers produce up to 190 litres (50 gallons) of nectar per tree in a season, attracting bats which may travel up to 19 kilometres (12 miles) between trees and transfer pollen in the process. Grows naturally in sub-humid to humid subtropical and tropical lowland to mid-elevation climates, generally areas with annual lows of 16 to 25 °C, annual highs of 26 to 35 °C, annual rainfall of 700 to 5000 mm, and a dry season of 8 months or less. New plants are usually started from cuttings or seed. Seed are preferred because the trees develop stronger roots but vegetatively propagated trees will start to flower and fruit much earlier, when about five to six years old. Performs best on free-draining clay, loam and sand soils of a moderately acid to slightly alkaline nature, generally with a pH of pH 4.7 to 7.5, and on sites with full sun exposure. Kapok is recorded as a weed of the natural environment in Australia and as a weed in a few other places where it has been introduced. However, there does not appear to be any record of it anywhere as a serious weed or invasive species. Its assessment by the Hawaii Pacific Weed Risk Assessment project (HPWRA) has not found it to be a high weed risk for Hawaii. Dewey, L. H. 1943, Fiber production in the western hemisphere, U. S. Department of Agriculture (USDA), Washington D.C.